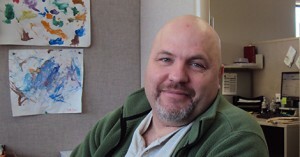 Eric has been a volunteer with Disability Network Southwest Michigan for the past 19 years. Over the years Eric has been involved in a variety of roles including volunteering with our Transportation Advocacy Team, Access Advocacy Team, serving on the Board in several roles, helping with outreach at community resource fairs, being a presenter for our disability diversity panel presentations, being a strong advocate for transit in St. Joseph County, and being a member of number of committees. With his knowledge of assistive technology for computers, Eric was a key volunteer when we had a computer learning lab on site in the late 1990s. Eric works hard on the commitments he makes as illustrated by many years of dedication and service to Disability Network. Thank you Eric, for all your hard work and dedication to Disability Network Southwest Michigan. Congratulations on being the February 2016 Volunteer of the Month!